Those of you that know me probably figured that food would show up on this blog eventually. I wanted to share one of my favorite holiday/comfort foods. It's also one of the easiest possible things to make. It only has 5 ingredients, of which I can almost guarantee that you will have 4 in your cabinet right now. Just pick up some canned cream corn and you are ready to go. 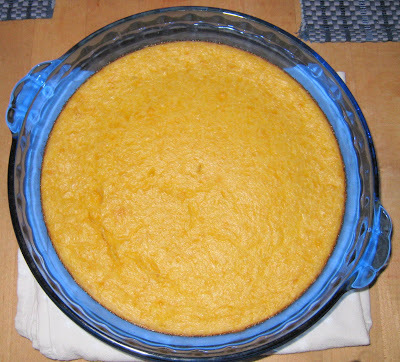 I grew up calling it Corn Pudding. The Texan has renamed it Corn Souffle, but don't let that intimidate you, it isn't finicky like a souffle. It also isn't as fluffy, it's more creamy. Whatever you call it, it's comfort food. This recipe is a must for me at Thanksgiving. But don't save it just for Thanksgiving. It's also incredibly quick, simple and easy to double or triple. It is great as a side dish any time of year. -Bake 35 minutes or until knife inserted in center comes out fairly clean. It's pretty moist, so the knife won't be spotless, but you don't want it be wet. When making a batch this size, I have used a loaf pan and a pie pan. Obviously the loaf pan makes a deeper finished product, it also takes a bit longer to cook. I recommend a pie pan or a small casserole dish. It's a very tolerant dish, you really can't mess it up. Just don't leave the sugar out. I did that intentionally when I made it most recently. I thought I remembered my Mom saying that she didn't put the sugar in. I thought I would be healthy and leave it out. But it is less then 1/2 teaspoon per serving and it really brings out the sweetness of the corn.